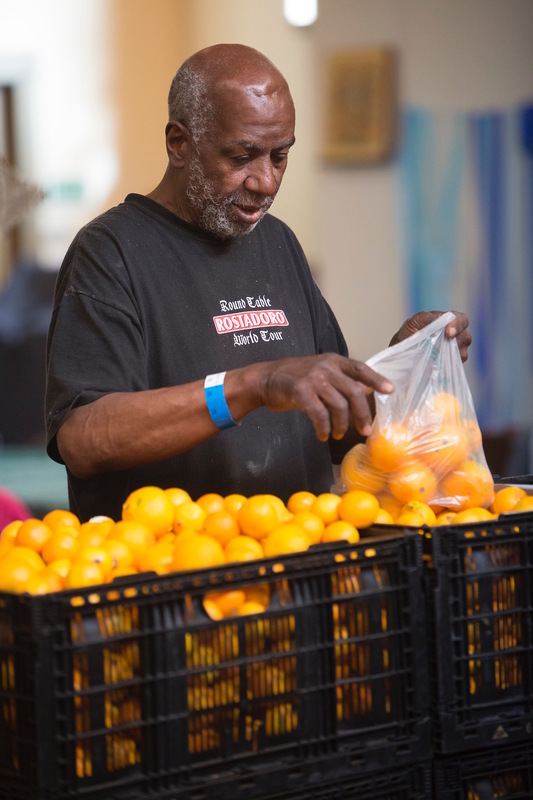 As the year turns, we once again are filled with gratitude for all who make The Food Pantry possible: those who grow and pick our food; those who deliver it to us; those who haul sacks of potatoes, break down boxes, greet visitors, sweep the floors, and invite new volunteers in; those who support us with donations, and those who pray for our entire community. 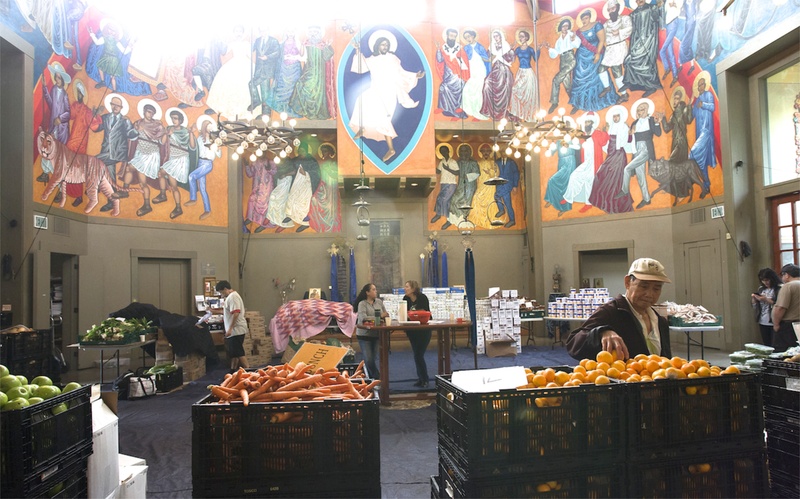 Please give generously: $50 will provide fresh, healthy groceries for a family for a year! 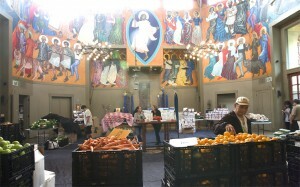 You can donate online here, or mail a check to The Food Pantry, 500 DeHaro, San Francisco CA 94107. NOTE: The Food Pantry will be CLOSED on December 28 and January 4. Happy holidays! Please join us to celebrate eighteen years of The Food Pantry on Friday, November 2, at 11AM. We give thanks for all the people who have been part of this community, and who sustain it with their presence, prayers and love. The Food Pantry will be closed until January 5, 2018. 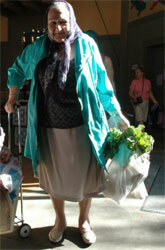 At The Food Pantry, we welcome everyone to get food and to give food. We’re grateful for our volunteers of all ages, and we particularly appreciate the ongoing help from students at Live Oak School. Please contact us if you’re interested in volunteering (individuals only, no groups, please.) You can lend a hand any time from 9AM-3PM on Fridays. Our people are facing a great deal of change in the coming years. It’s hard to know what to do as individuals, and as communities: yet we know it’s crucial to continue to act. And so we welcome all people to The Food Pantry to feed and to be fed, to take care of each other, and to build community. Our deepest thanks to our volunteers, to our donors, and to everyone who makes the work of The Food Pantry possible. 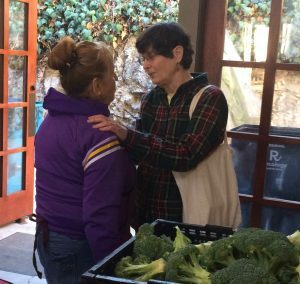 The Food Pantry celebrated sixteen years of work this November, with deep gratitude for all our amazing volunteers, participants and donors. We know what a hard year it’s been for people in our city, our nation, and around the world. Folks feel unmoored by current events, and frightened as they try to keep their families safe. 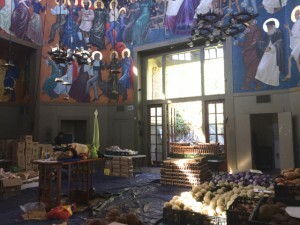 Amid sorrow, conflict, displacement, political upheaval and economic uncertainty, it remains a great blessing to participate in The Food Pantry––a place where every week, no matter what, all kinds of people come together to share food with their neighbors, and to care for each other in the most basic way. At The Food Pantry, we believe in building community by empowering people to work together and share food with others. It’s a privilege to be part of such a diverse, growing community–-and we invite you to be part of this meaningful work! The Food Pantry receives no government, foundation or church money; we’re sustained by people who care about making a real difference. 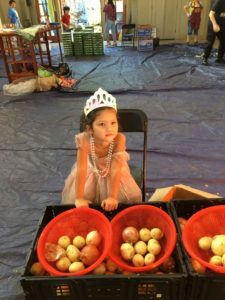 Your donation of $60 will help feed a family for an entire year: donate online, or mail a check to: The Food Pantry, 500 DeHaro, San Francisco CA 94107. 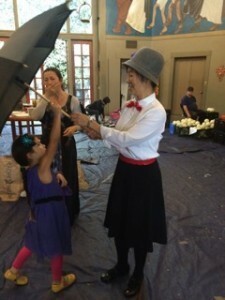 And come volunteer with us on a Friday, any time from 9AM-3PM–all ages are welcome. Thank you! Note: The Food Pantry will be closed November 25, December 23 and December 30, 2016. 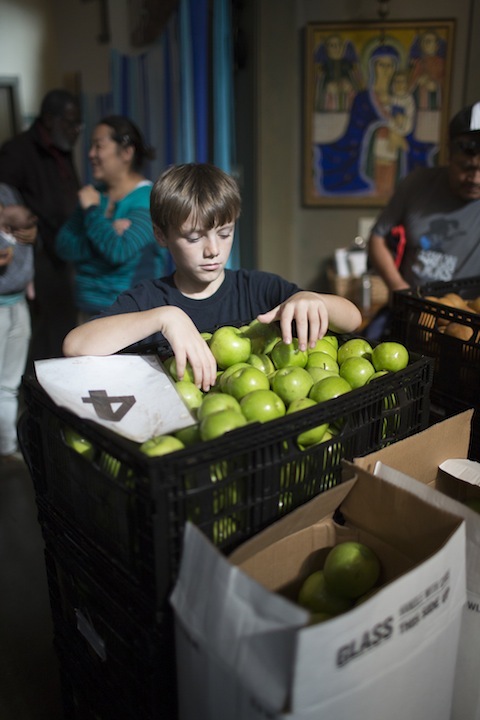 When we launched The Food Pantry ten years ago, we served 35 families. Now we have over 1,200 registered, and serve up to 600 a week. The Food Pantry isn’t funded by the church or by grants, but is supported by an all-volunteer staff and donations from individuals. We're proud of the way that our community has responded in these hard times. It still costs us, on average, just $1 to provide groceries for one family for a week--$50 will help feed a family for a year. 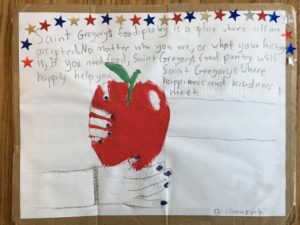 All donations are tax-deductible: you can mail checks to The Food Pantry, 500 DeHaro Street, San Francisco CA 94107, or donate securely online, below. Thank you for being part of this work!